The Israeli government deposited three major settlement plans for public review this week. As noted by Peace Now, all of these plans are related to efforts to legalize outposts located near, but not directly adjacent to, existing “legal” settlements — in effect creating three new settlements under the cover of legalizing “neighborhoods” of existing ones. Two of the plans deal with outposts located in the Jordan Valley; the third deals with an outpost located east of Ramallah. A plan to build an educational campus on land between the Maale Michmash settlement and the Mitzpeh Danny outpost, which dovetails with ongoing efforts to retroactively legalize that outpost. 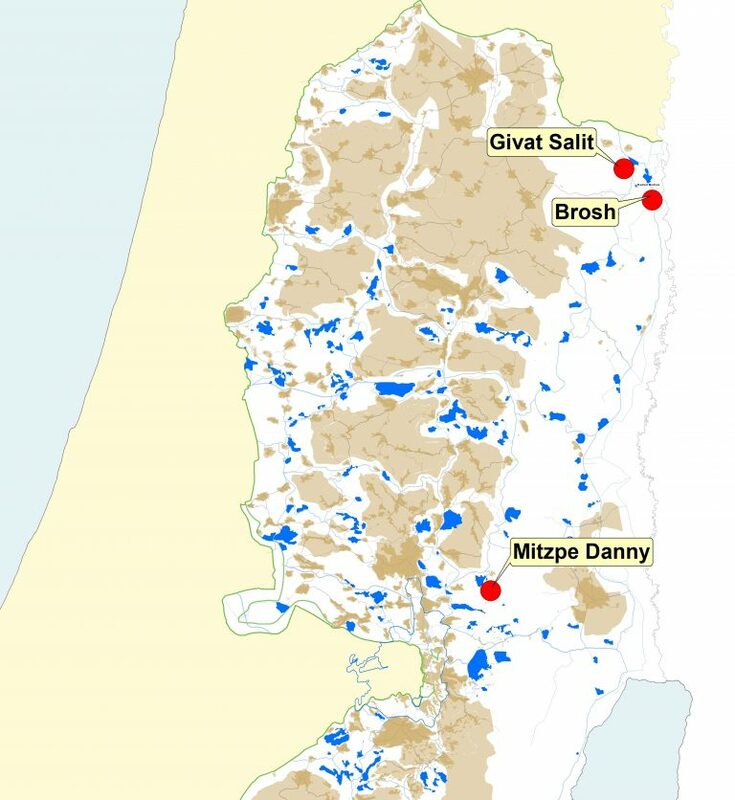 A plan to build 125 settlement units in the Givat Sal’it outpost, as part of preparations to treat the outpost as a “neighborhood” of the nearby Mechola settlement. On July 24th, hundreds of Israeli settlers snuck into the site of the long-evacuated settlement of Sa-Nur, located northwest of Nablus, to protest against the Cabinet’s decision to block a bill aimed at allowing the settlement to be rebuilt/re-populated. The protest was led by settlers who were evacuated from four settlements in the northern West Bank (Sa-Nur, Homesh, Ganim, and Kadim) as part of the 2005 Disengagement Plan, which also saw Israel evacuate its settlements from the Gaza Strip. Bayit Yehudi MKs Mualem-Rafaeli and Bezalel Smotrich, who were part of the group that infiltrated the site, have been promoting a bill that would overturn the 2005 disengagement plan, allowing Israel to reclaim the land and rebuild the settlements. According to Haaretz reporting, it is highly unusual for committee members to publicly criticize the committee’s work. Because the letter was read aloud during the committee’s meeting, the contents will be included in the official meeting minutes, making the members’ criticisms a matter of public record. As FMEP has previously reported, Ariel University became an accredited Israeli university in 2012, following significant controversy and opposition, including from Israeli academics. It has since been the focus of additional controversy, linked to what is a clear Israeli government-backed agenda of exploiting academia to normalize and annex settlements. Earlier this year, in an act of deliberate de facto annexation, the Israeli Knesset passed a law that extends the jurisdiction of the Israeli Council on Higher Education over universities in the settlements (beyond Israel’s self-declared borders), ensuring that the Ariel settlement medical school (and its graduates) are entitled to all the same rights, privileges, and certifications as schools and students in sovereign Israel. In March 2018, Lapid gave an interview to Newsweek where he was asked about his position on settlements. Lapid said that the “settlement blocs” will be part of Israel but did not elaborate when asked about the 1967 Green Line as a basis for a Palestinian state. In January 2018, Lapid supported a bill to extend the Israeli Higher Education Council’s jurisdiction over the settlements, an act of de facto annexation that is just one in a string of proposals for applying domestic Israeli law over the settlements. In September 2017, Lapid rebuffed criticism that his party was insufficiently supportive of the settlements, denying reports that Yesh Atid was boycotting a celebration of the 50th anniversary of Israeli settlement in the West Bank. In July 2017, Lapid railed against settlers who invaded a home in central Hebron, and called for their immediate removal. In July 2017, Lapid attended a ceremony in the unauthorized Netiv Ha’avot oupost, during which he promised to support the effort to legalize the outpost and save structures that the High Court ordered demolished.